No matter if there is a deal or no deal, Britain would end up worse off than it is today. This is why there is a general consensus that Brexit itself is a type of excess, even a type of collective suicide, pursued by a hardline group of people who always considered the European Union an alien and oppressive force, which in itself is a sign of a long-term crisis of British state development. As the Brexit debates continue, media in the UK are constantly saying that Britain has never been in such a position before. It is a completely open historical and political situation. There are many different scenarios. There are so many different tendencies and forces at work that one has to be a very brave person to predict how this will play out. Except that nothing good will come out of it for the UK. A no deal would have very damaging economic consequences; the deal negotiated with the European Union by Theresa May will stabilize the situation but while releasing the UK from the single market and the customs union, it is not clear that the UK will be able to negotiate beneficial free trade deals with any major country in any short time scale; a second referendum would be very divisive; while a general election would be fought over many other issues, as well as Brexit – although it would offer a way out of the impasse. The normal standards of government are collapsing: in terms of cabinet discipline, parliamentary relations with the executive, the balance of political parties within Parliament and in the country at large, and within the parties themselves. All of that reflects the fundamental tension between a perceived political necessity to respect the outcome of the referendum and the impossibility of finding a coherent policy that can implement that perceived political necessity. This has generated a lot of tension, splitting parties, splitting Parliament, dividing the government, and destroying normal patterns of cabinet rule. At the same time, Britain has major internal crises: of austerity, of local governance, a crisis in the health service, the under-funding of schools, and much more. Britain faces huge domestic problems, but for two years it has been obsessed by the question of the relationship with the EU. This week, Theresa May’s EU deal was rejected for a second time by a huge majority (129) – it was the fourth largest defeat of a British government in Parliament, following on the bill’s defeat last month by 230 votes, the biggest defeat of a government motion in parliament ever. Referring to the vote to reject a no deal, Dutch Prime Minister Mark Rutte put it well: “It was like the Titanic voting for the iceberg to move out of its way.” Next week, Theresa May is reintroducing her deal to Parliament for a third time. It is likely to be defeated again, although by a smaller majority. But she is banking on the threat for the hardline Brexiteers, essentially saying: “You vote for this deal or there may be no Brexit at all.” Even if next week Theresa May’s deal is accepted, she will have to ask to delay the implementation of Article 50 to 30 June; but if it is rejected, then the UK will have to ask for a much longer extension, or crash out with no deal. The EU27 will have to agree to this unanimously, and there are already some dissenting voices. The hardline Brexiteers want Britain to leave on March 29 with no deal. The Bank of England and some other forecasts suggest an up to 10% decline in GDP over the next ten years, but they hope to negotiate better terms of trade in the WTO framework. They seem to forget that negotiating free trade deals is not easy. Kevin Rudd, the former Australian prime minister, wrote this week that Australia has spent the last ten years trying to negotiate a free trade deal with India and they still have not yet got a basic framework of how it would work. And the British idea that they can restore the Anglophone sphere of economic relations which existed before the UK joined the EU in 1973 is impossible. The total market of Canada, Australia, and New Zealand is 56 million people, which is a pale shadow of the 450 million in the EU27. The point is that no matter if there is a deal or no deal, Britain would end up worse off than it is today. This is why there is a general consensus that Brexit itself is a type of collective madness, pursued by a hardline core of people who always considered the European Union as an alien and oppressive force, which in itself is a sign of a long-term crisis of British state development and English national identity. And this is not just the Conservatives. Gordon Brown, for example, when he signed the Lisbon Treaty (the Reform Treaty) (shaped by the British) on 13 December 2007, pretended to have a meeting in the morning so as not to be seen in public to be signing it. So the British position is intensely contradictory. At the same time, the pro-Brexit vote in the referendum on 23 June 2016 bundled up all sorts of genuine grievances into the anti-vote, including the marginalization of whole communities, precarious work contracts, and declining standards of living. These grievances are still unaddressed; and leaving the EU is not the answer to these problems – it is the substitute for an answer. Brexit is happening because the UK cannot support deeper domestic and fiscal integration in Europe which would lead to some kind of confederal system with a single currency, open borders and, possibly, a European Army. There is one very important point to make here: under any scenario this political crisis will intensify the constitutional crisis in the UK. There is already talk of a second Scottish independence referendum for Scotland (Scotland voted to stay in the EU in the referendum) to return to EU membership as an independent state. This will not be easy with Spain, bearing in mind its problems with Catalonia and other parts, will oppose such a move. In the long term it also means a crisis of the Good Friday agreement in Northern Ireland. It could well mean a return to violence and struggle for a referendum on Irish unification. As for Russo-UK relations, they are bad and will probably become even worse. It is very difficult to see a scenario in which there will be an improvement. It is illogical and damaging to all concerned, but a symptom of British state and social crisis. Russia has been the historical enemy, and even though fought on the same side in two world wars, there is a deep well-spring of suspicion and hostility dating back to the nineteenth century. After Brexit in whatever form, the UK will become even more dependent on the United States, especially as it searches for a trade deal. In addition, to compensate for the absence of the EU, London will seek to intensify its commitment to NATO and the Atlantic security system as part of its repositioning as ‘Global Britain’. This whole model of Global Britain is predicated on Britain restoring elements of its imperial great power status that it had in its imagination up to fifty years ago. It is a backward-looking project which does not envisage any progressive development of mutually beneficial relations with Russia. But Britain is also alienating China. Defence Secretary Gavin Williamson, who is not a fan of Russia, said that one of the two new aircraft carriers would be deployed to the South China Sea. The Chinese immediately suspended trade talks with the UK. There is a small chance that Russo-British relations might improve if Labour wins. The Labour Party would try it, but there would be the same sort of process that we see in Russiagate in the US, with attempts to discipline the Labour Party and to stop it from seeking a rapprochement. If the Corbynite wing of the party can maintain its positions – and Corbyn has been dedicated to the peace agenda his whole life – then there is a possibility of at least things not getting worse vis-à-vis Russia. However, if Corbyn loses his leadership (not imminent, but with a large bloc of Labour MPs opposed to him, not ruled out), then the Labour Party, like the Democrats in the United States, will be a strongly anti-Russian party as well. The election of the current Labour Party would be a type of mini-revolution in the UK. The focus would be on transforming domestic politics, so they would try to stabilize relations with Russia so as to concentrate on the massive task of rebuilding British society and economy the British state, to overcome the constitutional crisis to keep Scotland on board and maintain peace in Northern Ireland. The agenda would be enormous. However, it is important to stress that under Theresa May things will only get worse. She has a unique ability to turn a disaster into a catastrophe. Britain is in a crisis. What the rest of the world is seeing today is how badly governed the UK has been for the last two decades. Brexit has exposed the fundamental crisis of English and UK identity and purpose in the world. It never found a role for itself after the end of empire. France reinvented itself as the leader of European integration after it lost its empire. Germany was defeated in war and reinvented itself as a powerful economic player devoted to peace. Britain, like Russia in many ways, does not know what is the meaning and purpose of the British state today. Russia is beginning to find answers to this question. 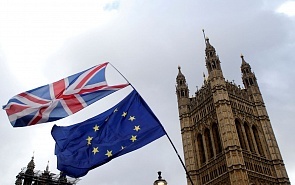 Britain tried the European Union, but failed to become a full member. I have always joked that Britain cannot leave the European Union because in certain respects it never joined - in the psychological and sociological sense. It was a failure of leadership lasting many decades, and there is little sign of that failure being overcome any time soon.